Catherine is Mom to Mila and an Integrative Nutrition Health Coach. Catherine healed herself from various autoimmune conditions through diet and organic, holistic living. She is deeply passionate about empowering parents to make informed decisions with regards to what they feed their children and themselves. Catherine sees her, and her daughter's, food intolerances as a blessing which has led them down a path of learning, discovery and good health - which will hopefully stand them in good stead for years to come. Food is a basic essential of life. But when food becomes toxic to the body, then it is time to re-evaluate what is in the food. Even so-called fresh produce can be laced with pesticides and GMOs, which can be, and is, terribly toxic to a lot of people, especially small children who are just beginning to grow and develop. With the increasing use of pesticides and the preference by governments, farmers, food manufacturers and grocers to promote GMO foods, learning to eat wisely and safely is a quagmire of obstacles and unknown variables. What’s needed? A useful, informative guide to help young mothers feed their children healthy food alternatives, food that not only is safe for the child, but looks good and tastes delicious. That’s where this book comes in handy. Catherine Barnhoorn had to heal herself from many autoimmune conditions and, when her newborn, Mila, started showing unusual and concerning symptoms, this young mother started researching and implementing a healthier, safer diet program for both herself and her new baby. As she researched and developed hundreds of recipes, she started to develop an idea of an extensive health guide that would not only explain the perils we now face with trying to eat healthily, but also the many options available to improve our eating habits. The result? 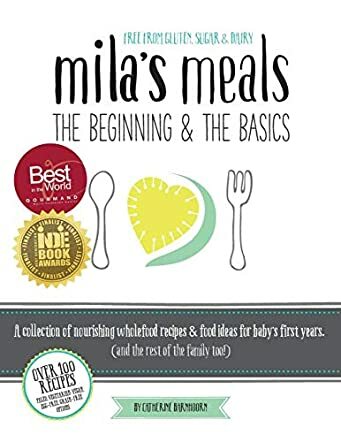 Her 500-page book, Mila’s Meals: The Beginning and the Basics. This is a must study, must enjoy, healthy eating alternative not only for feeding children, but also for feeding ourselves as adults. Everything you could possibly ask about the difficult food industry is answered in this book. Beginning with her own story, Catherine leads the reader through her experiences and sets us up with a course of action: first and foremost, read the labels and be aware of what you are eating. She complements her discussions with concise charts of the good and the bad in different food groups. She lays out the research compiled on the subject of food intolerances and allergies, and she provides a great resource of recipes, from snacks to main course meals to yummy desserts, and all that you could possibly want in between. The glossary is succinct and very thorough and useful. This is a must have guide for all young mothers and for anyone who wants to eat healthily and stay healthy. Well done! A great resource. Love the photos of Mila. I got this book, even though I haven't started a family. Though the focus is very much about the first year of your child's life, it has countless recipes that are valid and applicable to everyone and anyone. So, though I'm sure it is the absolute best thing for a soon-to-be-mom or new mom, anyone can add this to their cookbook collection and find much use out of it. One of my favourite aspects is the attention to detail and the work that went into finding the right balance of GF starch/flour combinations for each recipe, so that it's not just the usual "buy a premade GF flour option" but an actual tailor-made GF recipe that works for each and every recipe in particular, for the best taste and consistency. You can see that the amount of work put into this book is staggering, and impressive. This is my bible when it comes to preparing food for my little one. So much information, so many great ideas, a phenomenal glossary. I would say that every single mom-to-be should read Catherine's book (not to mention any adults suffering from auto immune issues!). Her gentle approach to introducing solids without falling prey to society's obsession with unhealthy "treats" for babies and toddlers is refreshing and inspiring. Gut health starts from birth and will effect your child's health throughout his/her life. It is time we start taking this seriously. Incredible. Phenomenal. Amazing. Honestly - one of my greatest purchases! Every single mother should have this Encyclopedia/Recipe book at hand. Catherine has done the groundwork and research for all of us and she has lovingly chosen to share not just her recipes, but every tiny bit of information she has learnt along her journey. From details regarding enzymes, to enlightening information on antioxidants, to stating at what age each meal is suited to, to explaining each vitamin or nutrient in a simple table format, and even how long one can store each recipe and every ingredient (all 156!) This thick 500 page book is unbelievably amazing and beautifully written with such love and passion to help other mothers understand what food can and will do to your children. So please, don't even doubt to purchase this book. It is worth every single cent. Then I challenge you to find the passion in yourself that wants the best for your child and start learning these new food names and start cooking.......the recipes are uncomplicated and so detailed even the most inexperienced cook would be able to make them! This book is a detailed compendium of all things nutritious and nourishing. A veritable Bible of whole foods, it has everything you’ll ever need to understand what and what not to feed your baby—as well as yourself. The best parts of the book debunk the traditional myths of what to feed your child then re-educate with solid science as to what to do differently—including a glossary of nutrients and many resources teaching you what to avoid. The how includes over 100 creative and delicious-looking recipes made with healthy whole foods and free from dairy-gluten-sugar as well as strategies for introducing your child to the world of “other people’s foods.” Catherine Barnhoorn gives you in-depth tools for raising your baby to be truly healthy, as opposed to the compromised type of health we’ve all come to expect on the average diet. You might just want to be reincarnated as her child! This book is so full of info, do-able recipes and beautiful photos. My rather fussy son loves the fruit leather rolls, and another favourite is the avocado based icing/frosting. I can't wait to try more of the recipes in here. What a beautiful and information packed guide and cookbook for nourishing your baby. Catherine shares her pre pregnancy health challenged journey through the birth of her daughter. Motivated by her babies health challenges and gastro intestinal symptoms she embarks on journey of research and discovery. Catherine guides the reader to take an active role in educating yourself on the foods you choose for your child. There are invaluable chapters on whole foods nutrition, avoiding food additives, rainbow nutrition, techniques on proper food preparation that help with absorption & many delicious recipes. This is a resource book that I will recommend to families with newborns, one that you will refer to over and over again. Thank you Catherine, I wish I had this resource when I was a new mom. Remember when we were told not to play with our food. Wow, I wish I could have a do-over. This book will shed light on how you look at your child’s moods, foods, toxic exposures, colic, constipation, ear infections, runny nose, asthma and so much more. When we know the reason why our kids are not feeling well, it’s so much easier to find solutions. With all the things we have to do as a parent, we forget to teach our children how important self care is as they grow. Well baby makes a well adult! Plus, I found the conversation between Catherine and Mila so heartwarming. Thank you Catherine for sharing your love, truth and your knowledge. New mothers need this book! Just received my copy! Wow, what an inspiring recipe book! Beautifully presented and all the information & recipes easy to read. A must have for any-one wanting to start their children on healthy, nutritious eating habits. Not only what to eat but, importantly, why to be gluten, wheat, dairy and sugar free! Can't recommend this book highly enough. I certainly wish my mother had this book when I was a baby, spending my first year of life in the hospital due to food allergies! So many newborns suffer for sensitivities and it is an area that needs attention! This books does just that and provides families with easy recipes for any infant, providing healthy options that are easily available in any home! This is a "go-to" resource for any new mother! A must have for sure! I could not wait to get my hands on this book, and I have not been disappointed, it is amazing! Wow, such heart and soul and not to mention knowledge and must have information are within these pages. As a mother raising three young sons I have been inspired to continue on my journey to health. I will certainly highly recommend to others. This is a wonderful book to start with if you don't know anything about whole foods, labels on food, buying all the correct ingredients and helping to change your way of eating more healthy. Thank you Catherine for putting it all together in one book. I wish this was available 10 yrs ago when I started this journey when my husband was diagnosed with cancer. This book is a phenomenal guide and REFERENCE on clean eating for your little one... and actually for the whole family! It even guides on boosting breast milk supply! Enjoyed reading it cover to cover, and so thrilled to own it as a reference book. At last, a wonderfully creative and thoroughly well researched work of immensely helpful and beneficial guidance, for us as parents! In today's information age nutritional concepts can be all too confusing, especially when the information is focused on 'what' to eat, rather than exploring and understanding the 'why'. This book introduces important and comprehensible 'why's' of applying food as your medicine, while at the same time, offering truly sumptuous and easy to follow recipes. This well-researched and masterfully created book is a true gift to aware parents who want to give their children the best start to life. Catherine has managed to fit a veritable encyclopedia worth of knowledge and wisdom into this beautiful book. As a mother, I will value this resource for referring to time and again when preparing food for my family. I will turn to it when deciding on the best choices, in terms of personal and environmental health, while shopping and preparing delicious, healthy meals for my loved ones. This massive book is a mother-daughter team work. Itshares much nutrition information and tips, plus one hundred recipes. The photography is delightful. This is an excellent book." So please, don even doubt to purchase this book. It is worth every single cent. Then I challenge you to find the passion in yourself that wants the best for your child and start learning these new food names and start cooking.......the recipes are uncomplicated and so detailed even the most inexperienced cook would be able to make them! I ordered this book apprehensively because I love seeing a recipe book before I buy it. I usually only buy it once there are at least a dozen recipes that appeal to me. It was the authors philosophies that convinced me to buy this book: that all disease starts in the gut, we shouldn be eating dairy or sugar and that with the right meal prep eating right can be possible for a working family. This book has delivered over and above what I expected! I haven tried any recipes yet (I only just got the book), but every one has appealed to me so far. I love that its written by a South African so she uses produce that isn impossible to source or too expensive to afford. Nearly all her recipes can be frozen with handy instructions on how long theyll last in the freezer. e deliberating on buying this book, just do it! Itll make a wonderful gift for anyone wanting to eat healthy (not just moms).